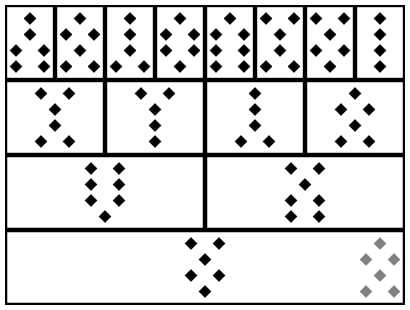 Generating a complete geomantic chart can be a little daunting for people new to the art of geomancy. I think it’s simple enough to learn, but there’s a fair bit of calculation involved. It’s definitely more difficult than Tarot, where you just shuffle some cards and lay them out wherever you damn well please, but not as difficult as doing an astrological chart by hand (but then, who does that anymore?). The Judge must be an even figure. It is impossible for a well-formed geomantic chart to have an odd Judge; evenness is often called “impartiality”, and Judges as well as judges must be impartial in deciding a case. Judge figures must be even due to the formation of the Daughters from the Mothers. The Daughters make use of the same points from the Mothers, transposed so that they’re arranged in a different direction; thus, the number of points in the Mothers are the same as those in the Daughters. Any number duplicated yields an even number, and the process of adding figures (or distilling them from the Mothers/Daughters to the Nieces to the Witnesses) preserves this kind of parity. Thus, the Witnesses must be either both odd or both even, and in either case must add to an even figure. The Judge is the only figure in the chart where this rule must apply. At least one figure must be repeated in the chart. As it turns out, no complete Shield chart with 16 geomantic figures can have all 16 distinct figures; there must be at least one repeated figure in the chart somewhere. It may be possible that the first 15 figures (Mothers, Daughters, Nieces, Witnesses, and Judge) are distinct, but then the Sentence must of necessity repeat one of the other figures. Consider that the Judge is formed from the two Witnesses, which themselves are formed from the four Nieces, which are formed from the eight Mothers and Daughters combined. The Judge has eight separate roots, which may very well be distinct. However, the Sentence is formed from adding the Judge to the First Mother. Because the Judge also relies on the First Mother (via the Right Witness and First Niece), you’re essentially adding the First Mother to itself, which yields Populus; Populus, when combined with any other figure, repeats that figure. Because of this “hidden repetition” in the chart, there’s bound to be at least one figure repeated in the chart somewhere, even if it’s just the Sentence. That said, there are only 16 charts that have the first 15 figures unique, but that’s a topic for another day. The inseparable pairs must add to the same figure. This is an idea picked up from the Madagascan tradition of geomancy of sikidy, and shows the validity of the internal structure of the chart. The idea here is that certain pairs of figures in the chart must add to the same figure: adding the First Niece to the Judge, the Second Mother to the Sentence, and the Second Niece to the Left Witness all yield the same result. Similarly, the Left Witness added to the Sentence, the Right Witness to the First Mother, and the Second Niece to the Second Mother also yield the same result. This is because the “units” that add up to any child figure (First and Second Mothers for the First Niece, or all the Mothers and Daughters for the Judge, or all the Mothers and Daughters for the Sentence with the First Mother duplicated) are the same within these groups of inseperables. Any set of addition of “units” where two figures are repeated cancel each other out, forming Populus; the remaining figures add up to a particular figure that the other inseperables must also add to. So, as an example, say that we have the following chart, where we have Via, Acquisitio, Coniunctio, and Laetitia as the Mothers. Carcer, Cauda Draconis, Amissio, and Fortuna Minor are the Daughters; Amissio, Cauda Draconis, Caput Draconis, and Coniunctio are the Nieces; Rubeus and Tristitia are the Witnesses, Acquisitio is the Judge, and Amissio is the Sentence. Since the two sets of inseparable pairs add up to the same figures, respectively Via and Puella, this also checks out. We can now rest assured that our geomantic chart is valid and proper for reading. Do I do all these checks every time I calculate a geomancy chart? Lol nope. When I calculate a geomancy chart by hand (I sometimes use a program I wrote for this to automatically give me all the information I want from a chart), I’ll often just check the parity of the Judge and leave it at that. Still, learning these rules and how the internal structure of the shield chart works is important to geomancy, since it underlies not only the mechanics of getting the divination system to work but also indicates important spiritual and oracular connections between the otherwise disparate symbols used. I’ve been following your blog for a while now and wanted to thank you for sharing your knowledge and insights. I’ve haven’t worked with geomancy and am intrigued. Actually, more than intrigued. Like yourself, I read signs and symbols carefully. I had a powerful premonition this past Saturday night and looked to astrology to validate what I saw. The premonition and astrology charts confirmed my worst fears regarding my family karma and my future. The thing is, it feels like the universe has been pushing me hard down this path from the past and the fact that I’ve received this warning has me feeling rather confused now… Like, wait a minute, you’ve set me up to take flight and just at the last instant before I jump, I see that in the end, it won’t turn out as I hoped it would. So now I’m in a state of confusion and limbo. Was my premonition just my subconscious fears rising? Or, was it a gift, a warning to me? I’m at an extremely critical juncture in my life path but feel like I’m too close to the situation to be truly objective about what I’m seeing. I’m intuiting that you may be able to shed some light for me and am wondering if you take clients and what your price is? I do take clients; check out the Services page (link at the top menubar) towards the right. There are buttons and PayPal thingies for individual rituals or readings, though you might also decide to email me for a more detailed request beyond what I have listed there. Just lemme know. The first question that I ever recorded in my book turned out (to my relief) to be an uneven/partial Judge…you once again helped me out!